Summary: The jagoffs are broadening horizons, getting to know more than Allegheny County. The famed Lincoln Park Performing Arts Center serves as the backdrop of ‘Singin’ In The Rain’ and the Ya Jagoff Podcast where we welcomed Beaver County Times entertainment delivery person, Scott Tady, LPPAS Artistic Producing Director Justin Fortunato and Arthur Moats is exploring with us and provides a little something for your listening pleasure. Press the play button to listen to the podcast. Don’t see the player bar above in your email? Click on the one below to listen to the podcast while you pretend like you’re working today! Music: Arthur Moats on the piano! SPONSOR: Total Sports Enterprises packed bags and moved five minutes and about two miles down the road to 100 Business Center Drive off of Campbells Rub Road. The move means more room, more inventory, more exciting opportunities and more black and gold for your man cave. Visit the new showroom and warehouse off of Campbells Run Road and check out the TSE’s new look. Prepare for our big grand opening from May 2-4 and as always visit tseshop.com for all of your black and gold needs. Question of the day: Do you sing in the rain or only in the shower? 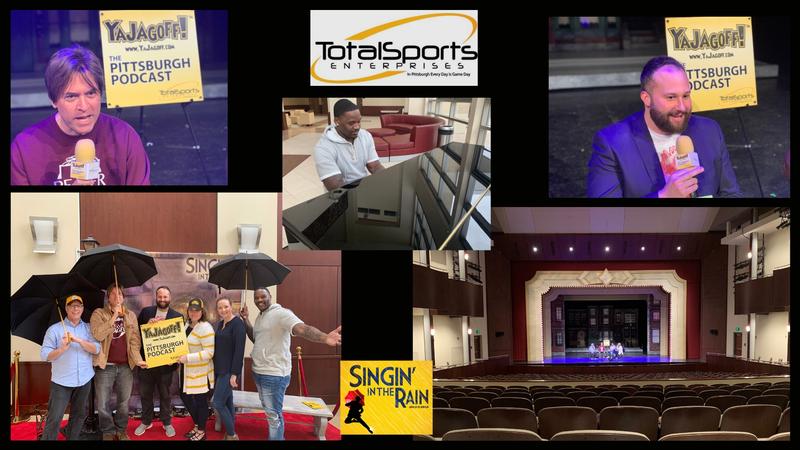 4:54 Arthur Moats: Arthur Moats strikes the ivory keys on the podcast to showcase his self-taught piano skills, while discussing his recent cruise adventures, upcoming dodgeball tournament with Santonio Holmes and family stories of dancing in the rain. He is most known for his career in football, but his unspoken advocacy for musical arts shines the spotlight for his unwavering passion as he provides his top 5 musicians in Moats’ Notes. 20:03 Justin Fortunato: Justin Fortunato, Producing Artistic Director at Lincoln Park Performing Arts Center talks about Beaver County’s top destination spot for live entertainment. A warrior of theater, Fortunato has produced a haven of resurgence and vitality back to performing arts. Currently, Singing in the Rain will be the feel good show to attend until April 14th in which patrons can experience a classic musical filled with top performers, enchanting music, and live water during the performance. 38:44 Scott Tady: Scott Tady, Entertainment Editor and Columnist for the Beaver County Times joins the podcast in order to direct his influence on capturing the best of the entertainment realm in Beaver County and around the Pittsburgh region. As journalism evolves with the trends of technology, Tady incorporates videos as a visual aid to the changing landscapes of storytelling. Listen closely as he gives listeners an inside scoop to Beaver County’s highly anticipated announcement that will help ring in the new year on high notes! 57:23 Arthur Moats: Arthur talks about his mucial selections for the episode. Who knew? “Everything BUT The Kitchen Sink” Attacker!